Bev, Matthew and our children, James & Amelia. We started keeping poultry as a hobby in 2004, when our son was born. After initially buying a few Hybrids for eggs for the kitchen we were soon hooked and wanted to have a go at breeding. 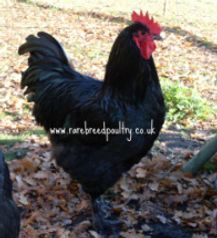 We initially decided upon Booted Bantams as a bantam breed and the Croad Langshan as a large breed, both of these breeds are naturally good with children and we have never looked back since. Of course once we started breeding we wanted to have a go at showing our birds - mainly so that we could get feedback on how we were doing with our breeding so that we could continue to improve our birds. We started showing our birds in 2009 and since have won many awards at the National Level Championships. We continue to show our birds always striving for perfection in the breeding / show pens. 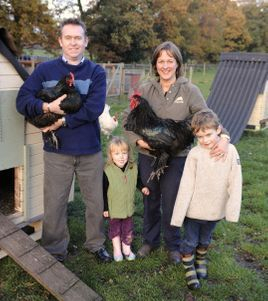 In 2010, We were featured on Channel 4 - introducing a family to the joys of keeping poultry. Practical Poultry visited us and wrote a fabulous article on us as a family - January 2011 edition. Our children, who by this time had their own breeds (Silkies and Polands) have also followed in our success in the show pens, taking National awards themselves. 2010 saw us starting our Poultry Keeping courses (we unfortunately no longer run courses due to other work commitments) - which were a real success. It is something we had wanted to do for a while and it has been a joy meeting new keepers on our courses, some of these attendees have since gone on to show their birds and are also having great success at the highest level. We hope you find our website helpful and informative. The content of the website is purely our opinion. If you are at all unsure about the health of your birds you should immediately seek Vet advice. If you notice anything in my website that you disagree with please contact us so that we may rectify the matter. We hope, if you take the decision to keep poultry, that you have many happy years, stress free with happy birds. If you would like any help or advice just email us and we will do our best to help you.